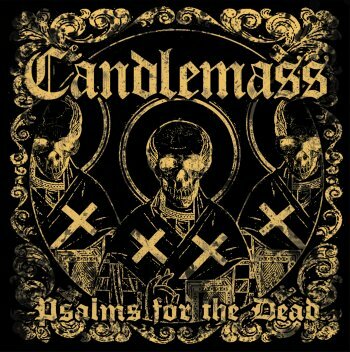 CANDLEMASS - PSALMS FOR THE DEAD (CD) | Online Shop | Wizard LTD. Album: "PSALMS FOR THE DEAD (CD)"
"Psalms for the Dead" is the Swedish doom metal legend&apos;s swansong. Contrary to the rampant rumors, the band will not be splitting up, but rather concentrating on live performances. CANDLEMASS&apos; final studio album shows a band at the top of their game and it will soon earn the cult status it well deserves. The release is filled with such highlights as "Dancing in the Temple of the Mad Queen Bee" or the sweeping opening track "Prophet", which beautifully showcases the band&apos;s strengths. Singer Robert Lowe (SOLITUDE AETURNUS) embellishes the songs with his characteristic vocals and sounds as though he has been a part of CANDLEMASS from the band&apos;s early beginnings. The powerful and crystal-clear production delivers a first-class sound that will send shivers down one&apos;s spine. Buy "Psalms for the Dead"... Hit play, and allow yourself to be a part of music history in the making! The doom metal legend&apos;s swansong!